thoughtSeekers is a video motivational platform which features individuals with outstanding attitudes and incredible achievements. Josh is a global nomad. His companies, projects, and interventions are helping shape the future of technology, the environment, and human consciousness. What would be the 3 words which best describe you? I like the word “integration”, but I love the word “enlightenment”. I love it because it is controversial; when you say it, it does something, it has a power to it; it inspires people and reminds them that enlightenment is a constant work, but you can have a negative reaction to it as well. I use that word a lot now because when I do half of the responses are along the lines of “thank you for reminding me2 and half of them are “you should not use this word”. 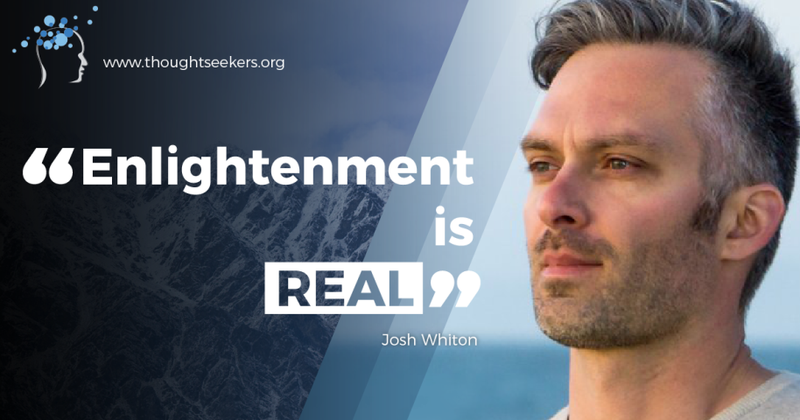 I will give one of my own quotes: “Enlightenment is real”. When the human being heals, we enlighten automatically, our consciousness enlightens automatically. This phrase takes us from something mystical to something actionable. The mind is not meant to exist by itself; many of our problems today are because the mind is dissociated from the rest of the self. But the mind does not exist on its own. Another quote of mine is “Reality is a very big place”. Many people perceive it differently but it is bigger than I feel it is. I am Josh Whiton and I do whatever I want. Different things have motivated me over time. At the beginning I wanted to be accepted, than I wanted to be good enough, than I wanted to be ok, than I wanted to be at peace, than I wanted to have purpose, to change the world, to save the world and now I am all the way to the point of getting in touch with what I really want, which is separate from the culturally programmed motivations, something different to ask. You need to find what motivates you in your core, in your truest essence, in your most authentic self. There are so many motivations which are coming to us which are programming from culture and family. I am still learning what motivates me. Right now it is actually pleasure and more and more mature forms of pleasure. For example, instead of trying to save the planet I want to be part of the planet because I believe it is beautiful. Pleasure, healing and enlightenment motivate me. I get my power from truth, where everybody gets their power from. Our power is in proportion with the amount of truth that we have apprehended, integrated in ourselves. Knowledge is power and knowledge is in the classical definition the sum of true beliefs that you have. Truth is the source. To the extent that our nature, our beliefs, our opinions, our personalities, our desires, our motivations are coming to congruence with truth, which is the fundamental nature of reality, our power grows, our power is in proportion to our level of truth which is in relationship with the nature of reality. What is your secret success recipe? One of my secret success recipes is to pay attention to when I am forcing something to happen versus when it flows so easily that it almost feels as magical. I take this as a sign that the most productive thing you could do would be to be in harmony with the reality around you and with all the people in your life, with the forces seen and unseen; then you have the power of the network behind you. We are just neurons in a global brain. You could just employ your own billion of neurons and that is not so bad, it is actually quite good, but even more powerful it is when your projects, work, purpose are not only a project inside of yourself but are shared inside a larger neuronal net, a network of resources around you. Which is far more powerful and intelligent than the smartest individual could ever achieve. Which were the highest obstacles that you had? How did you overcome them? It is easy to falsify myself, to forget my true self, to forget my authentic personality. It is a part of my mind, which has a survival mechanism and leads me to be whom I think you want me to be, what I can be in your presence. A challenge is to feel safe to be who I am. When I look at people I admire in history is their ability to do what they believed it was right in the face of thousand dissenting opinions. Very few people can stand that; if they find out that 10 people disagree with them, most people will be OK in changing their opinion for those 10 people. This has been a challenge in the past and it will be in the future. By all accounts today I am a very productive person with a lot of purpose and it would be hard for anybody to imagine that 12 years ago I was in bed for an entire year, depressed, no purpose, no meaning. I know that there are many people out there suffering from depression and in my case it was an existential depression. I just came to believe that there was no meaning in the universe, that the universe as such was just a pointless accident. My depression lifted in a 36 hours period. I allowed a conversation to unfold inside myself. A part of me wanted to believe that life was meaningful and another part of me wanted to believe that there was no purpose to life. Depression was the standoff between these parts of me. The moment I allowed the conversation to unfold instead of numbing it, I reached resolution inside myself. I went from having one half of myself pushing against another half of myself (leading to a depressed state, lying in bed and failing college classes) to starting several companies, turning my grades in school and regaining my life. I spent a lot of my life feeling like I lived in different worlds. Part of me lived in the business world as a tech entrepreneur, part of me lived in the environmentalist community and part of me lived in the spiritual community. These communities were not integrated. If you were part of one, you were not allowed to be part of the other ones. I had to hide part of my nature, I hid that I had spiritual experiences in the business community, I hid that I had money and success in the spiritual community. It took me a lot of time to have courage to state in these 3 communities that I am part of all 3. If you had absolute powers what would it be the first thing you would improve in the world? I would enable people to have more access to legitimate healing experiences. The world is a supercomputer with 7.5 billion CPUs on our planet, and to some degree they are all broken; transistors inside of them are fused, information is not perceived properly, output is not as good as it could be. It does not have to be that way, because the human being is incredibly reprogrammable. We can heal ourselves; we can reprogram ourselves into what we want to be. The human being is the most incredible supercomputer. If we get some of the bugs out and change parts of the architecture I believe we can change the world to a better place. There are some organisations I started in the past, which continue to work today, a company I started that makes public transport work better in 300 cities worldwide, millions of people take the train to work now instead of using a car, there is an urban farm, but all these are not satisfying, as nobody really knows what one’s legacy is. I hope that if I can just manage to be myself, the legacy will occur in the awake of that courageous act. What are your 3 core values? Growth – I can feel when I am growing, and I can tell after a while when I stopped growing. Love – it is so difficult despite it sounding a cliché. My life was until now partially supressing the love for the world. I am right now allowing myself to feel the love for the planet, as our planet goes right now through a lot of pain. Integration – all the pieces of myself, my subconscious mind, my conscious mind; they get to know and accept not another. Because this is also the source where one’s power comes from. What is the question that you ask yourself every day? If I stop and look around reality and ask myself: can I pick up on what it is that life force wants me to achieve? This question yields the kind of answer that goes into my productivity tip. Because if you get that answer, than all your projects and activities go much easier because you realize, that you are not doing it alone anymore.